Our Training Team is led by two family lawyer/mediator/arbitrators and one social worker, all with Masters degrees in our field of study. We collaborate extensively with colleagues across North America and around the world to deliver quality training. We are continuously studying ourselves, and our courses and workshops are updated each year as a result. We use the latest in adult education teaching knowledge and technology to bring our learners value and an enriched, rewarding experience. Hilary Linton started the business in 2001 after leaving her law partnership to specialize in alternate dispute resolution (ADR). 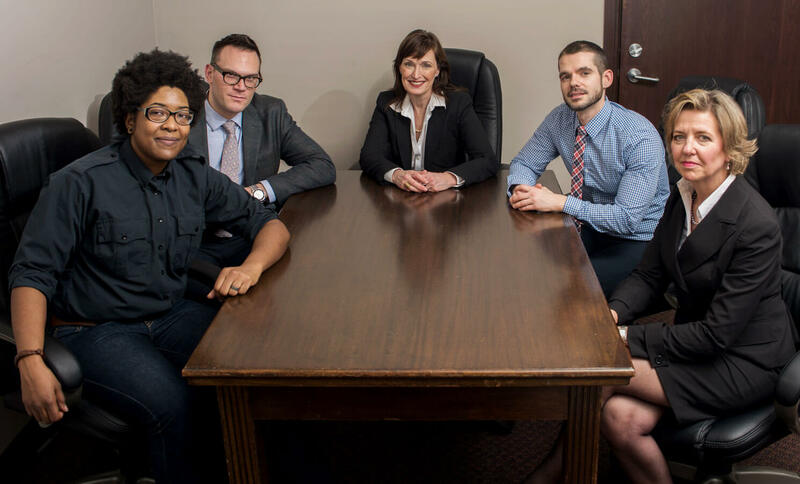 Our team includes Elizabeth Hyde, also a former family law lawyer, and Jared Norton, who has a Masters in Social Work and a clinical background. And we offer a comprehensive internship program that gives clients the benefit of co-mediation and helps train the next generation of skilled family mediators. From left to right: Rhodes Thompson-Chase (research, marketing, administration, ), Jared Norton (Family Relations Trainer, Parenting Coordination trainer), Hilary Linton (Family Mediation Trainer, Family Arbitration Trainer, Civil Mediation and Negotiation Trainer), Frank Guerriero (training coordinator, graphic design, website), Elizabeth Hyde (Family Mediation Trainer, Parenting Coordination Trainer). We know that most people want to resolve their conflicts fairly, effectively and efficiently. 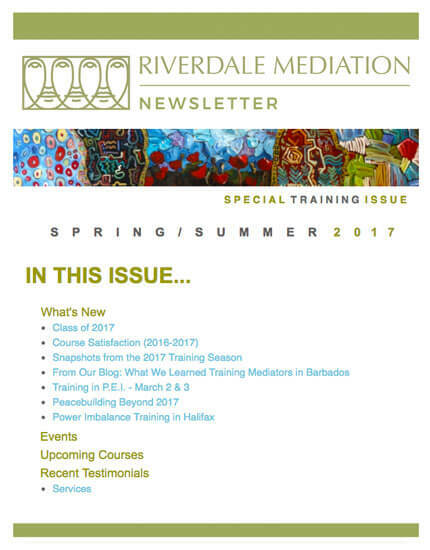 At Riverdale Mediation, we believe in empowering people and organizations to resolve their own conflicts or disputes, at the lowest cost and in the most satisfactory way possible. We also believe that mediation training and conflict resolution training should be an equal mix of theory and practice, relevant, and thoroughly engaging. The professionals at Riverdale Mediation have years of experience designing, delivering and teaching artful and practical dispute resolution processes and workshops.